Most of the larger American comic publishers are willing to create licensed publications for various organizations that aren’t sold through the usual markets. DC Comics, for example, has done free Superman giveaways for the United Nations, warning children in war areas of the dangers of land mines, and for the Doris Day Animal Foundation, telling kids not to torture pets. Marvel Comics created a series of Avengers comics for soldiers that were only sold through military exchanges. There have also been more mercenary crossovers; for example, Supergirl shilling Radio Shack computers in 1981. Archie Comics was the source of perhaps the oddest licensed publications ever. During the 1970s, they allowed Spire Christian Comics to use the Archie gang of characters in a series of religious comic books. These publications were kept separate from the regular titles, and they were sold only in Christian bookstores. Reportedly, they were quite profitable. While they were published under the “Spire” name, the Archie company did the packaging and printing of the books. It all came about because of artist Al Hartley. He’d been freelancing for Archie since the mid-60s, and after he became born again, he put together a proposal for Spire Christian Comics, published by the Fleming H. Revell Company. Unfortunately, details regarding this deal are now hard to find. When Archie Comics was asked recently to confirm some of the agreements, their response was a polite demurral because their records had been sealed and placed in storage long ago. Their other major difference is apparent from the opening pages. Archie’s Clean Slate begins with Archie having a nightmare about the devil trying to drag him down to hell. After he and Jughead arrive at school, characters talk about how everyone wants to be popular before Betty starts witnessing about God being the answer. Other students ask her questions, leading to additional openings for her message. Given today’s concern with protecting brands and keeping franchises as widely appealing and non-offensive as possible, it’s really weird to see such well-known characters outright preaching. And yet, what other well-known comic character would you better believe as a witnessing Christian who cares about the people around her than sweet, wholesome, all-American Betty? These books aren’t shy about their purpose or intent. They weren’t created to tell stories or jokes (although they do, along the way), but to express Christian doctrine, with plenty of Bible verses cited. I suspect these comics weren’t chosen by the young readers targeted, but by their parents, looking for something safe to give to their kids that reflects their values. Then again, some might say the same of Archie comics today. Given Hartley’s involvement, the cartooning is right in line with the other Archie books of the time. The characters are expressive, in both face and action, often exaggeratedly so. The settings are certainly diverse, with field trips to animal parks and hiking expeditions and plenty of beach tales, mostly to provide attractive backgrounds and the characters doing more than just talking to each other in school hallways. Getting the kids out of the classroom also allows them to take on bigger questions, as in Archie’s One Way, where the teens hold a festival to explore different ways to build a better world. Runaways show up several times, needing to be comforted and reassured that someone cared about them, and pollution is also mentioned as an issue of concern. This is a refreshing change of pace from Archie comics where the biggest issue tackled is who’s taking whom to the dance. I suspect that’s partially due to the times; I’ve read other Archie stories from the era where story premises involved the military draft and free speech. I don’t think many other comics were as open about teens being tempted by drugs or about kids in the hall “peddling pot”, though. 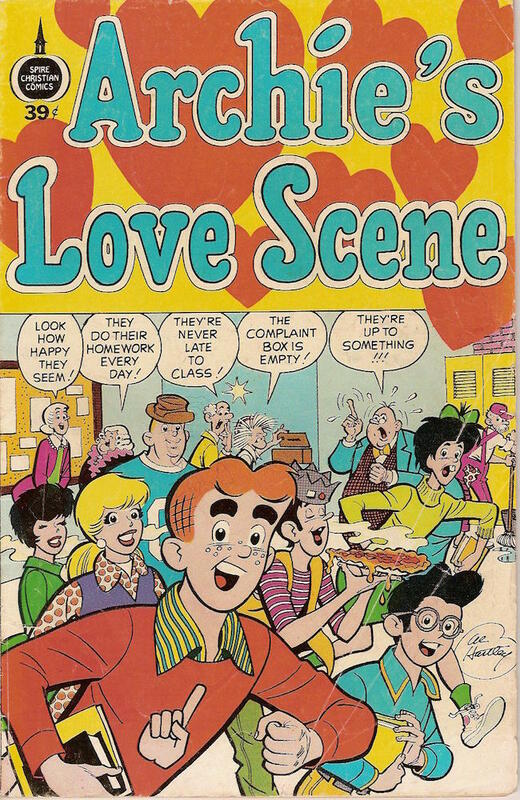 The decade’s influence can be seen in titles like Archie’s Love Scene, which today sounds racier than it did then. The stories here are all based around good and bad love, contrasting elopement with a God-centered marriage with family support or showing the importance of caring. Veronica’s the bad girl in most of this one, over-reacting and badmouthing others and abusing Archie’s affection for her. 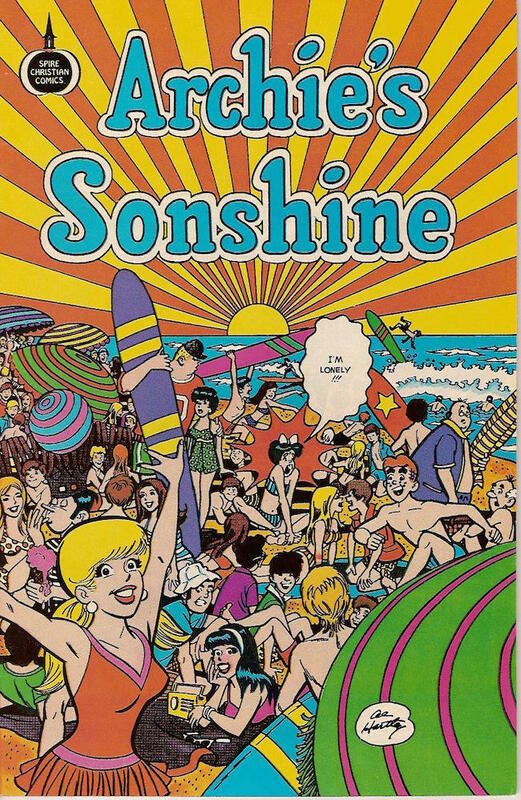 Archie’s Sonshine, on the other hand, mostly features a mysterious, bearded man preaching to the crowd at the beach. Big Ethel plays a big role in the comics, taking the place of the reader. She’s the only one of the core gang who can be made fun of, with her obvious imperfections (buck teeth, gawky figure), and thus the one who can ask questions and be enlightened most easily. Archie and Betty are shown as confident in their faith and near-perfect, with a good answer for most situations. Ethel (and to a lesser degree, Jughead, with his over-eating, and Reggie, with his egotism) is the character with the most flaws who can believably find God as the missing piece from her life. 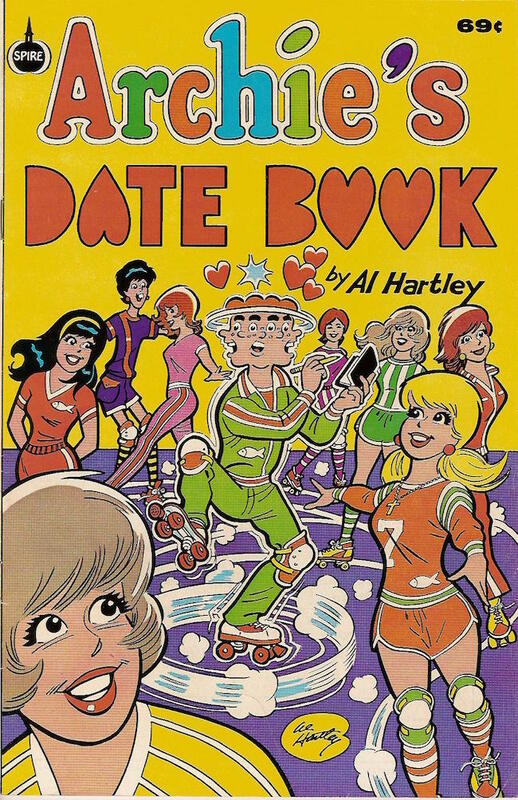 Hartley’s work for the regular line of Archie comics at the time was tackling similar themes. In fact, there’s a story in the 48-page Spire holiday special Christmas With Archie (1974) that has the same opening as a Hartley-drawn story in a 1970 Archie’s Christmas Love-In (Archie Giant Series #181). Both start with Archie and Jughead piling Archie’s car full of Christmas presents because Archie’s got a job delivering packages for a store. In the Spire Christian version, Jughead is driven crazy knowing that one of the presents is a fruitcake. He wants badly to eat it then, but he manages to deliver it to a woman who’s sharing it with all of her neighbors because she can’t afford anything more. Archie testifies to how that woman’s love is making her neighborhood a better place. In the regular Archie version, Jughead still has the ability to figure out what’s in the boxes. Most of them, anyway; there’s one that defeats him. When they deliver it to a poor but happy family, the mother reveals that the gift was a Bible. The story ends with the line “Young man, since you have the desire to open things, you’ll be glad to know our Bible is opened every day!” If it weren’t for the difference in publication dates, reading the two stories back-to-back, it strikes me that they might should have been switched. Two other stories in that issue also resemble material that appeared in the Spire book, one about Mr. Weatherbee not liking to be chosen Santa because of his weight, and another about how people’s tree decorations reflect their personalities. Other stories by Hartley are very similar. Ethel’s fantasy makeover in Archie and Big Ethel (1982) was a dream; the same thing was previously accomplished by witchcraft in Sabrina’s Christmas Magic (1972’s Archie Giant Series #207). In Archie’s Family Album (1978), one of the stories is about how much better things were in the past. 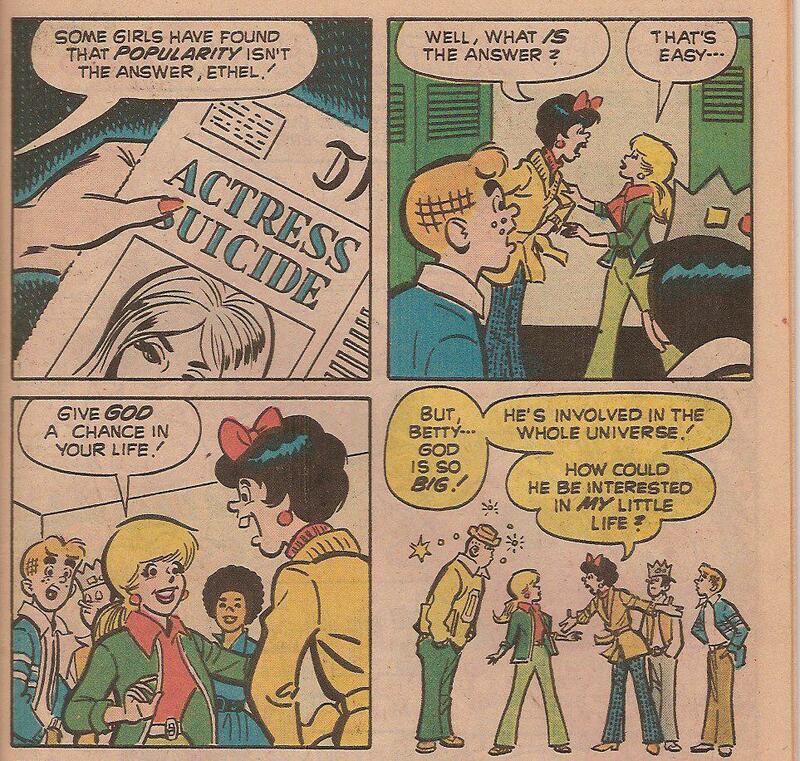 Life With Archie #129 (January 1973) takes an issue to explore the same idea, using some of the same jokes. The two stories I discovered that were the closest, though, were these. In Archie’s Love Scene (1973), Archie and Jughead are lost in his car on a scary, foggy back road. They meet creepy characters named Miss Terry, Crime, Hate, and Fear before they pick up a beautiful girl called Love. With her friends Faith and Hope, Archie and Jughead drive over a rainbow bridge to a sunny meadow. 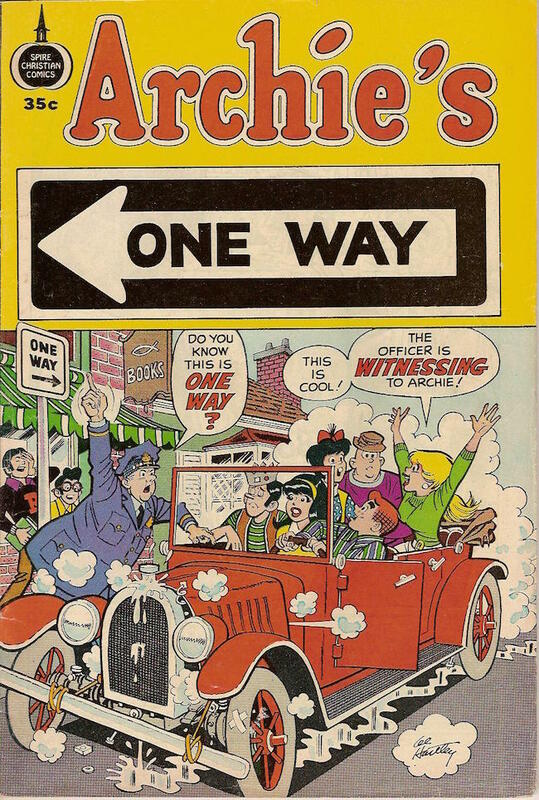 The same story appeared earlier in June 1972’s Betty and Me #42, only this time, it’s Betty and Archie who get lost on the explicitly labeled “Road of Life”. This story is longer, with the additional characters Frank, Ernest, and the twins Greed and Selfishness. There’s also a lot more explanation about Love being eternal and the importance of picking the right companions for one’s journey through life. In the Christian comics, when someone is needed to do the wrong thing, like cheating on a test, characters like the never-seen-before-or-since Jerry are trotted on. These stories can get surprisingly dark. 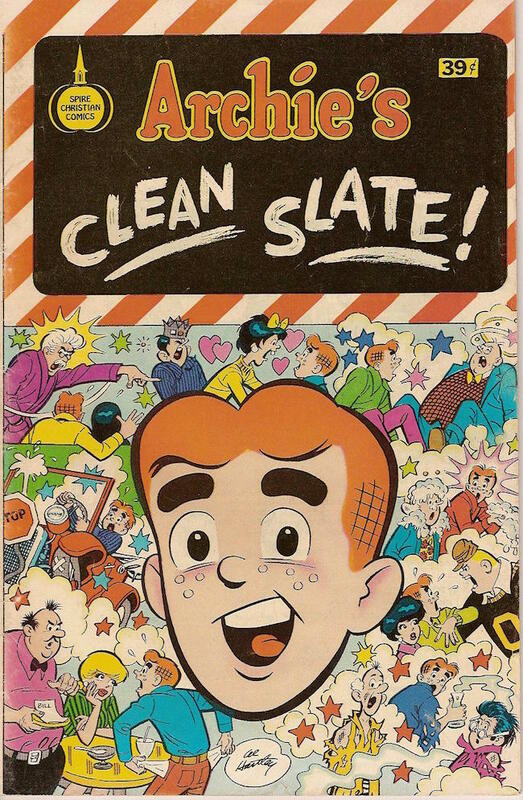 In Clean Slate, two drug-using schoolmates take off in their car after teasing Archie and Betty about how squeaky clean they are. Soon, there’s a car crash, and Betty winds up reassuring Debbie that she’s not going to die and praying with her before she’s pulled out of the wreck into an ambulance. Heavy stuff for the kids reading! None of the other comics went that far again. And by the 80s, the short feature arrangement had become one long story with the preaching saved for the end. It’s not a structural improvement, because the non-Christian material seems generic, and this reader kept waiting for the message to appear. The metaphors (cars, carnivals, dating, sports) aren’t strong enough to build a whole book upon, and the result seems more like a pamphlet, too light on substance and too much like a regular Archie comic, only padded. Half of Archie’s Date Book is just a setup to asking the readers to write in and share their dating advice for Archie, with letters published in later issues. These comics certainly aren’t for everyone, but they have a certain fascination for me. In keeping with their intended purpose and audience, they’re more didactic than entertaining. But they are a unique slice of culture, providing insight into an unusual time in popular history. Regardless of your beliefs, their sincerity and goodwill are heart-warming. There were a total of 19 titles, published from 1973-1984 and often reprinted. my son read all of these comics and wants to have them now for his children. Is there anywhere that any of them can be purchased. They can be found the same way most back issues can — check eBay or ask your local comic shop if they can help track them down for you.